The idea of Euro-Atlantic integration is unpopular in the south of Ukraine. 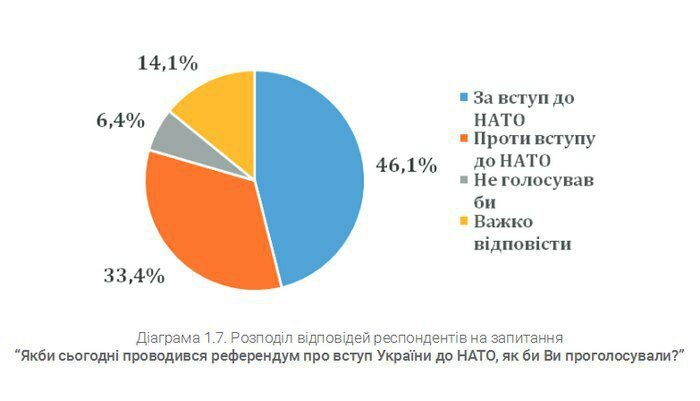 In a referendum on Ukraine's accession to NATO, 46.1% of Ukrainians would vote "for" as 33.4% would vote "against", a joint poll by Gorshenin Institute and the Friedrich Ebert Foundation in Ukraine & Belarus. According to the poll's findings announced at Gorshenin Institute on Tuesday, 11 July, 14.1% of respondents could not answer this question while others (6.4%) would have ignored the referendum. In regional terms, an overwhelming majority of the residents of the Western region (76.5%) favour Ukraine's accession to the Alliance, while 60.5% of the inhabitants of the South oppose it. This indicator has not changed significantly compared to the previous surveys conducted by Gorshenin Institute in the previous ten years,. The study was conducted by Gorshenin Institute and the Friedrich Ebert Foundation in Ukraine & Belarus by face-to-face interviews. In total, 2000 respondents aged over 18 have been interviewed in all regions of Ukraine (except for the occupied territories of the Crimea, Sevastopol, Donetsk and Lugansk regions). The margin of error did not exceed 2.2%.